Decorative storage bins and totes are a great way to make your home look less cluttered while also adding your personal style to any room in your house. Make these storage solutions yourself and personalize them to fit your style and storage needs. We've got a DIY storage solution for anyone. Declutter your bedroom and bathroom, organize your office, learn how to utilize wall space to the best of its potential, and craft tons of decorative storage boxes and bins to use in any room of the house. The bathrooms and bedrooms are often the messiest, most cluttered rooms in the house. Wrangle your clutter and organize everything in decorative storage containers that fit with your decorating style. When you DIY, you can design decorative storage bins and other storage solutions to look however you want. Sophisticated Bathroom Storage: Organize your bathroom while adding some decorative flair with these Cricut decorating ideas. The sophisticated bathroom storage container is ideal for hiding odds and ends in the bathroom. Bed Pockets: Create these crafty bed pockets for a great do-it-yourself storage solution for the bedroom. Perfect for storing books, magazines, and other items, kids especially will enjoy using these unique storage containers to keep their rooms clean and their belongings safe. Cute Toilet Paper Storage: Looking for DIY storage solutions? Repurpose an oatmeal container to use as cute toilet paper storage that will blend in nicely with your bathroom decor. Beady Jewelry Holder: Decorate a plastic box to store your retainer, or to hold jewelry. This is a great way to personalize your belongings if you're going to camp or on a trip. It just takes seconds! NEW! DIY Inspiration Board: This great project for a padded fabric and ribbon inspiration board comes to us from Allison of the ever-inspiring Petit Elefant. Using fabric which matches your decor, create one for the kitchen or the crafting corner in your home. Short on room? Start using your walls as storage space by making one (or all!) of these hanging storage solutions. If you've got small closets or cramped rooms with little surface space to set things on, take advantage of your vertical space and hang up your junk. An added bonus of making decorative storage for your walls is that it doubles as wall art! 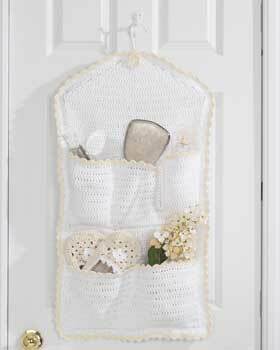 Pocket Hanging Storage Crochet Pattern: Crochet a pocket catch-all to hang from a door or in the closet for extra storage. This is an attractive way to keep essentials easily at hand. Floral Wall Organizer: Learn how to make a fabric wall hanging organizer with this handy tutorial from Earth Safe Finishes. This Floral Wall Organizer is great for storing recipes, mail or whatever else needs some order. Water Bottle Storage: Upcycle some water bottles into storage instead of letting them sit in land fills. You can have an organized craft room while being green if you recycle containers with water bottle storage. Crochet Baby Hanging Storage: Crochet a handy hanging catch-all for baby with pockets for any baby essentials, toys or accessories. A gingham heart and border makes it a decorative accent for the nursery. NEW! Dresser Drawer Frames: Transform Dresser Drawer Frames into unique and stylish wall art. With a cheap chest of drawers, you can create this fun storage system, perfect for displaying art or storing bathroom items. Thrift store crafts like this are always so much fun to put together! Decorative storage totes, decorative storage bins, and other containers work hardest in the office. Manage your pen collection, stash important papers, and file away things you don't use on a daily basis using these genius office storage solutions that you can make yourself. You won't believe what some of these decorative storage ideas are made from! 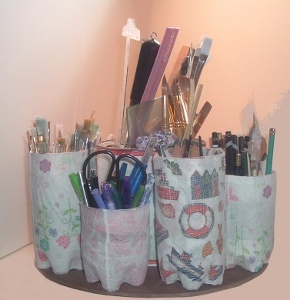 Water Bottle Supply Organizer: Here are some great ideas for crafts made from recycled items. Use these instructions to make a water bottle supply organizer, an easy way to organize your crafting supplies with water bottles and other recycled items! Desktop File Box: Create a cute, garden-themed box in which to organize seeds with tabbed dividers. Not a gardener? Use it to organize note cards with recipes, addresses, and more! You can also add magazine clippings to the different sections. Trendy Magazine Holder: Your magazines will have a trendy place to hang out in this painted espresso and spa blue holder. Stainless Steel Office Organizer: This unique mail organizer is easy to make and budget-friendly. Recycle old CD's to create a fun organizer for your office. NEW! Colorful Bead Jar: If you need a organized yet adorable method of storing beads, then you'll love this Colorful Bead Jar. Upcycle items you would otherwise throw away thanks to glass jar crafts like this one. Add colorful beads to the glass for a pretty look. Fancy and Fabulous Storage Containers: If you're looking for fun storage crafts that can be used year round, decoupage ideas like these Fancy And Fabulous Storage Containers are a perfect match. 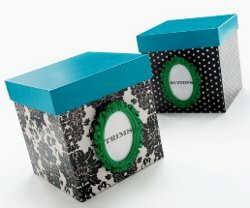 Decoupage paper mache boxes like these and you can store anything in them! Bird's Nest Photo Box: Paint a beautiful spring scene complete with bird's nest and vibrant flowers to store your photographs and other memories. This painted storage box makes a great Mother's Day or birthday gift. Classy CD Storage: Stack CDs in this fresh, funky storage box, made with soft acrylic paint and embellished with a monogram. Floral Vegetable Storage Crates: Store everything from potatoes and other veggies to gardening supplies in these cheerful, colorful storage crates. Treasure Box: Create an altered art treasure box made with embossed metal, stamp art and wire form. NEW! Decoupage Storage Bins: Turn a plain wood storage bin into a beautiful home decorating accent with this decoupage craft project. Use your favorite scrapbook papers and embellishments for this decorative storage project. Some of these are good ideas. 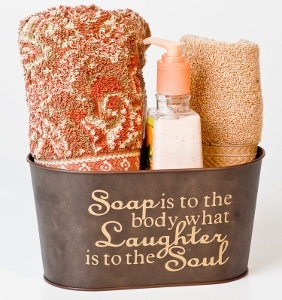 I like the soap container thing as a gift idea. However, I personally, don't want CRAFT IDEAS to store craft suppiles. I don't need more little boxes or plastic bottles cluttering my work space. I want actiual storage solutions. Something clean and clutter-free, especially for a small space. Does anyone have ideas? Can someone direct me to a good site? FaveCraft is the best of the best for any and all of any craft idea you could think of and most of them are quite easy. Another thing is you may see a craft and put your own ideas into it. After using the drawers from a dresser with a little help the dresser could be used for a bookcase or additional shelf space. I purchased decorative boxes (or plain) at the dollar store and used colorful wallpaper that matched the room decor (in this instance the bathroom). I roughed up the surface of the boxes, and the cheap plastic garbage can, then paste the paper on the sides or top. Now I have a complete set for one room that matches. And if I change my decor, I simple peel off the paper and start fresh with a new design.